Churchill's polar bear holding facility got a visit from an unexpected guest on Thursday: a nearly 400-pound barren ground grizzly bear with a suspected criminal past. Churchill's polar bear holding facility got a visit from an unexpected guest on Thursday: a nearly 400-pound barren ground grizzly bear, with a suspected criminal past. 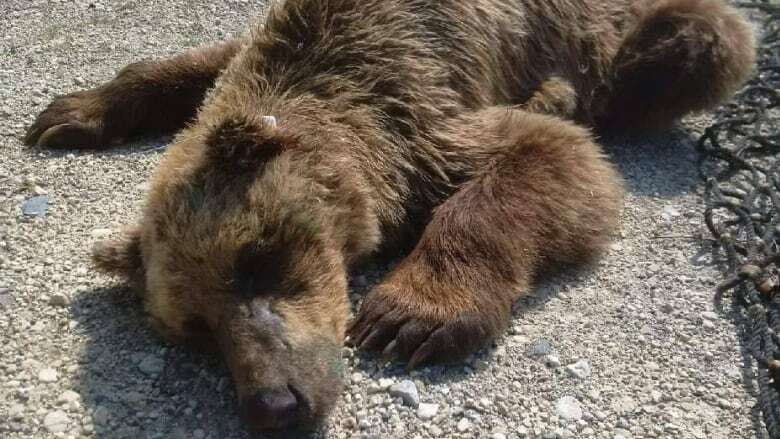 Jeff Chuchmuch, a resources officer with the province, said provincial sustainable development officers had been getting calls about a bear breaking into homes and cottages near Churchill since July 16, but until this week they thought it was a black bear. That's what a pair of his colleagues expected Thursday morning when they went to see what had been caught in one of the two bear traps they had set in response to the calls. "We were under the assumption that the bear responsible for breaking into these cabins was a black bear. To our surprise, it actually turned out to be a barren ground grizzly bear," Chuchmuch said Friday. Barren ground grizzlies aren't common in Manitoba, he says. They're protected under the Endangered Species and Ecosystems Act, and although sightings have been increasing in recent years, there was a decade-long period in the late '90s and early 2000s when none were seen in the area. The bears are smaller than coastal grizzlies — this particular adult male weighed in at 388 pounds — with humped backs, large front claws and shaggy brown coats. The residents who had reported it thought it was a cinnamon black bear, which are more red-brown than standard black bears. Sustainable development staff brought the bear back to Churchill's polar bear holding facility, where they gave it a GPS-tracking ear tag and a lip tattoo before releasing it north of Churchill, toward the Manitoba-Nunavut border. Chuchmuch said sustainable development officers still don't know whether the bear lives in the area or wandered down for the summer from Nunavut. He's hopeful the ear tag will help researchers learn more about barren ground grizzlies in that region. "For the next four months, it's going to be transmitting once a day its location," he said. "What this is going to tell us is, for the next four months, when that grizzly bear is going into hibernation, it's going to be able to show where exactly it's actually going in." It's also not clear how the bears would interact with local polar bears, he added, or how they might respond to people. "My suggestion, especially within the greater Churchill area, is if you see a barren ground grizzly bear just call our polar bear alert line," he said. "Our staff will come out and make an assessment of the bear in particular.